A number is a digit (0, 1, 2, 3, 4, 5, 6, 7, 8, or 9), a combination of digits, or a combination of one or more digits, a separator, and one or more digits. Microsoft Access supports three categories of numbers and there are various ways you can apply one to a field. You can work in either the Datasheet View or the Design View of a Table. A natural number is one that contains either only one digit or a combination of digits and no other character. Examples of natural numbers are 122, 8, and 2864347. Microsoft Access supports different types of natural numbers. A byte is a small positive natural number that is between 0 and 255. To create a field that will need this range of values, display the table in the Design View. Specify the Data Type of a field as Number. Then, in the lower section of the table, set its Field Size to Byte. This function takes one argument as the value that needs to be converted. It then converts it to a Byte. An integer is a natural number larger than the Byte. It can hold a value between -32768 and 32767. Because an integer can hold as much value as the Byte, you can apply the integer type wherever you would use a byte type. Microsoft Access supports the integer type through a data type called Integer. Like the byte, you can specify an Integer data type only in the Design View of a table. 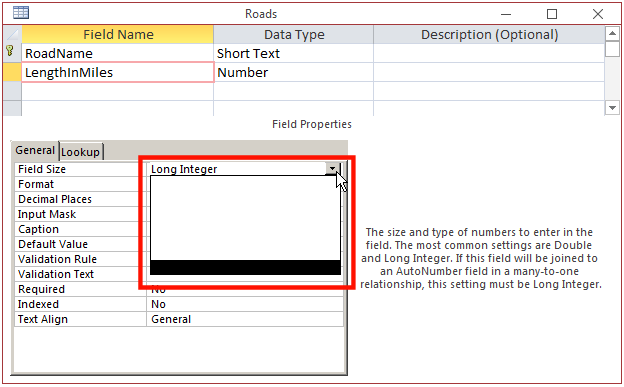 To apply the Integer data type to a field, in the Design View of the table, after specifying the field's Data Type as Number, in the bottom section of the table, set its Field Size to Integer. The function takes a value or expression as argument. It then converts that value or expression to an integer. Normally, when you set the data type of a field to Number, it is automatically set to Long Integer. If that's the data type you want, there is nothing more to do. This function takes one argument that is a value or an expression. It converts it to a long integer. To support long integers, the SQL provides the INT, the INTEGER, and the LONG data types. They are equivalent to the Long Integer in Microsoft Access. One of the rules that the primary key must follow is that it must be able to uniquely identify each record in the table. One way to solve this problem is to manually add a unique integer. Of course, adding the numbers manually can lead to errors. As an alternative, Microsoft Access can generate a unique number for each record. To support this concept, the application provides the AutoNumber type. To automatically have a unique identifier associated with each new record in the database, create a field whose data type is AutoNumber. When a field receives this data type and when the first record is created, it receives the number 1. Every time a new record is created, the number is increased and assigned to the new record. The number never repeats. If a record is deleted, the numbers are not reset: the deleted record is gone with its assigned unique number. This ensures that each record keeps a unique number. The AutoNumber in Microsoft Access is not an actual data type, just like the other options of the Data Type combo box of the Design View of the table (their names are only made friendly to help select a type). AutoNumber is actually a long integer. A column or field created with the AutoNumber type is the good candidate for a primary key. If you start a new table in the Datasheet View and the automatic column is created, that column is also automatically made a primary key. Of course, you can create an AutoNumber field in the Design View and make it a primary key. If the primary key is of type AutoNumber, the foreign key should use the Long Integer as its data type after selecting the Number in the Data Type combo box of the Design View of the table. Microsoft Access supports various types of decimal numbers. When using a decimal number, you may or may not be interested in a high level of precision for that value. If precision is of lesser importance, Microsoft Access provides the Single data type. A single is a decimal number whose value can range from -3.402823e38 and -1.401298e–45 if the number is negative, or 1.401298e–45 and 3.402823e38 if the number is positive. To apply the Single data type to a field, you must open the table in Design View. 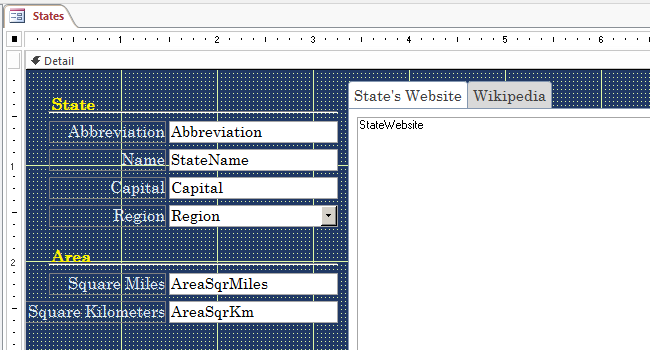 After specifying the field's type as Number, in the bottom section of the table, set the Field Size to Single. We will make suggestions below. This function takes one argument as the value or the expression that needs to be converted. It then converts it to a Single value. Each of them is equivalent to the Microsoft Access Single data type. Remember that, after writing code, you must execute it, which is done by clicking the Run button in the Design tab of the Ribbon. If you want to use a number larger than the Single type can carry, use a data type named Double. This type is used for numbers that range from 1.79769313486231e308 to –4.94065645841247e–324 if the number is negative or from 1.79769313486231E308 to 4.94065645841247E–324 if the number is positive. Besides supporting large values and this high level of precision, the Double data type provides various other options. To apply these options, you can use either the Datasheet View or the Design View of the table. To apply the Double data type to a field, open its table in Design View and set the field's Data Type to Number. Then, in the bottom section of the table, set its Field Size to Double. This function takes one argument as a value or an expression to be converted. It then converts it to a Double type of value. A number can be very large, made of many digits. An example is 971792074. To make a large number easy to read, you can separate the thousands with commas. An example is 971,792,074. This is referred to as the standard notation. To support the standard notation, the Number data type provides an option of the same name. A number is said to have a fixed precision if it doesn't include the thousands separator in its notation. Microsoft Access support this notation. It is set the same way we reviewed form the Standard notation. The SoldItems table should still be opened in the Design View with the PurchasePrice field selected. A number is referred to as percentage if it represents a fraction of 100 (it is actually a number between 0 and 1). In most cases, a percentage value is written with the percent symbol, which is %. The FunDS1 database should still be opened. Besides the regular format we are used to using to represent a number, another technique consists of writing the number as an exponent. Using this technique, instead of using 1000 to represent a thousand, you can use 1.00e3. This is referred to as scientific notation. This function takes one argument as the value or the expression that needs to be converted. It then converts it to a currency value. 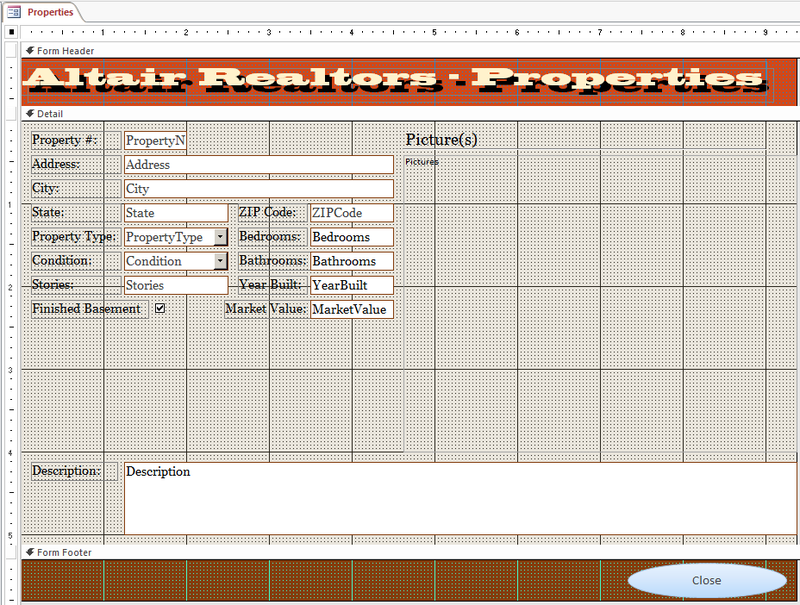 The Properties table should still be opened in the Datasheet View.